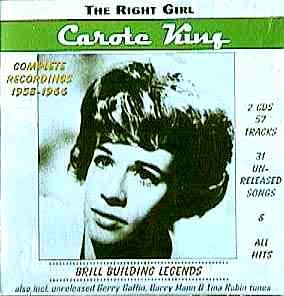 A list of songs Carole King composed during the Brill Building era. While the list is fairly comprehensive, it is probably not perfect. The list is graphic and spread out over four pages. To ensure the list is legible, each file is rather large. The pages may load slowly. Proceed to part one of the song list, >>>presented by Spectropop! This two-CD set is comprised of ultra rare singles and unreleased Aldon Music and Screen Gems demos from the late 1950s through the middle of the 1960s. Included in the set are the singles King released as a solo artist for several labels. The rest of the collection is a treasure chest of unreleased demos from the early 1960s. Carole King file at Yahoo! b. Carole Klein, 9 February 1942, Brooklyn, New York, USA. 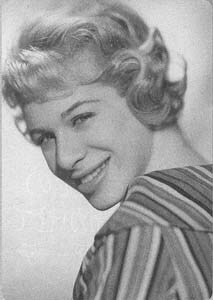 A proficient pianist from the age of four, King was a prolific songwriter by her early teens. When friend and neighbour Neil Sedaka embarked on his recording career, she followed him into the New York milieu, recording demos, singing back-up and even helping arrange occasional sessions...">>>presented by Yahoo! Spectropop text contents © copyright 2000 Spectropop unless stated otherwise. All rights in and to the contents of these documents, including each element embodied therein, is subject to copyright protection under international copyright law. Any use, reuse, reproduction and/or adaptation without written permission of the owners is a violation of copyright law and is strictly prohibited. All rights reserved.